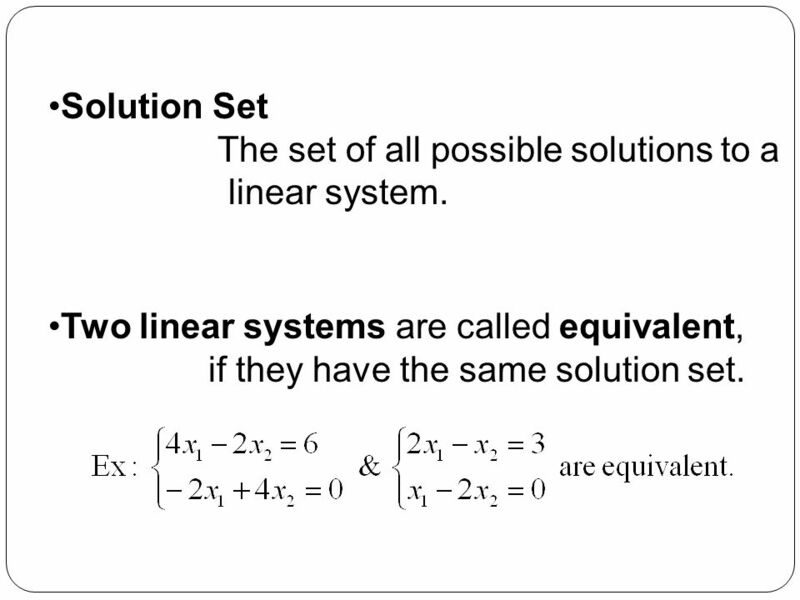 4 Solution Set The set of all possible solutions to a linear system. 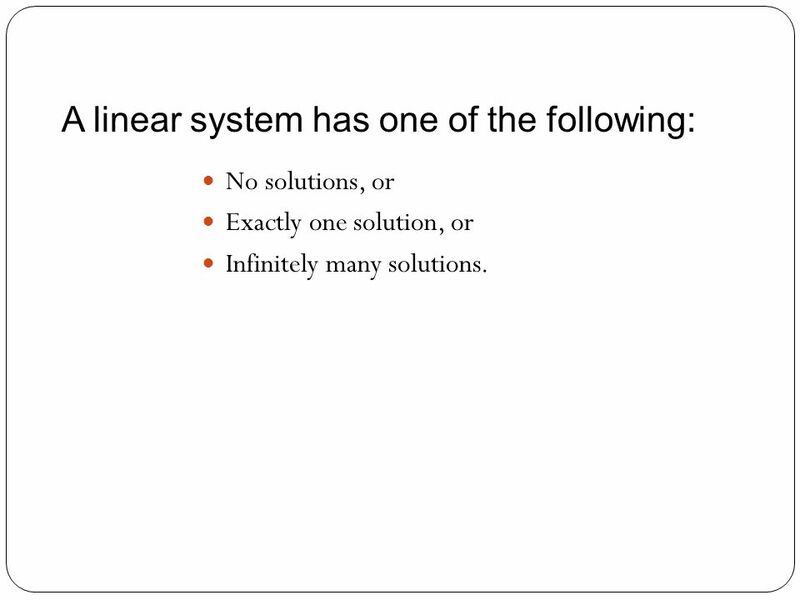 Two linear systems are called equivalent, if they have the same solution set. 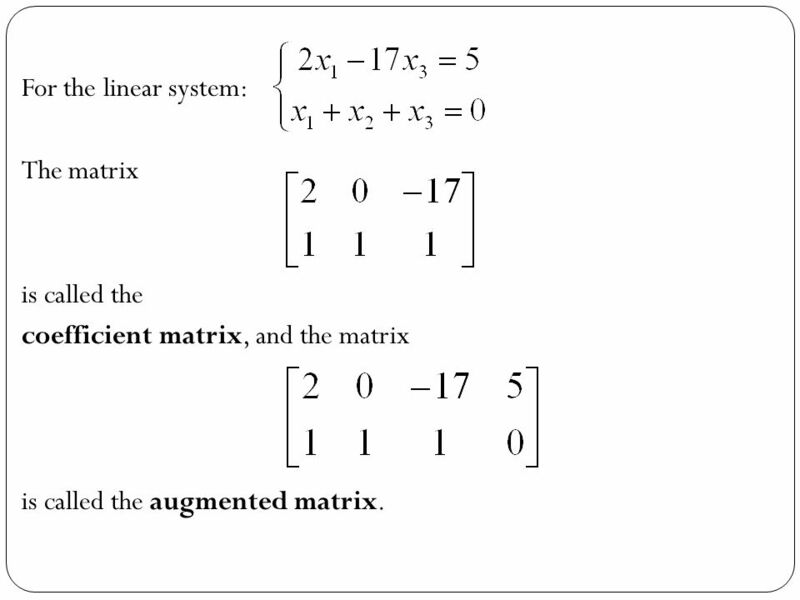 6 For the linear system: The matrix is called the coefficient matrix, and the matrix is called the augmented matrix. 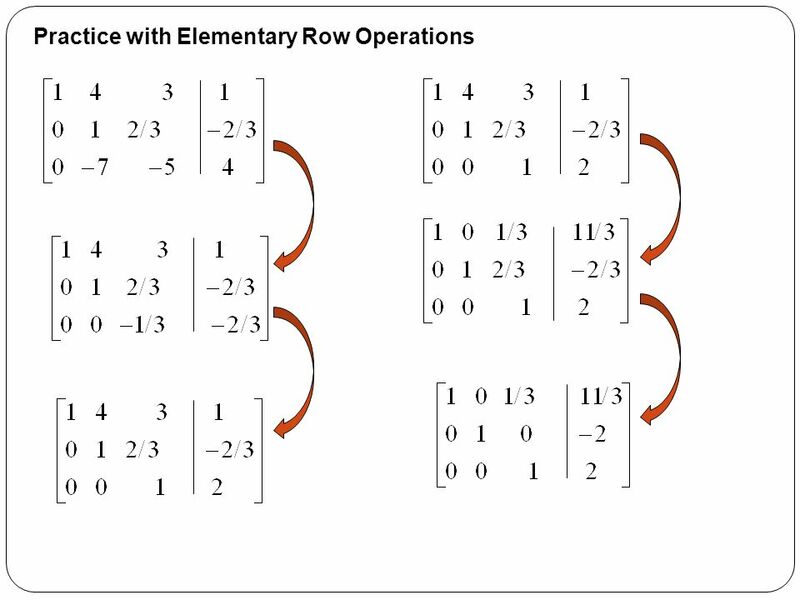 The leftmost nonzero entry in each row is 1. (If the row is not all zeros, this entry is called the leading 1.) 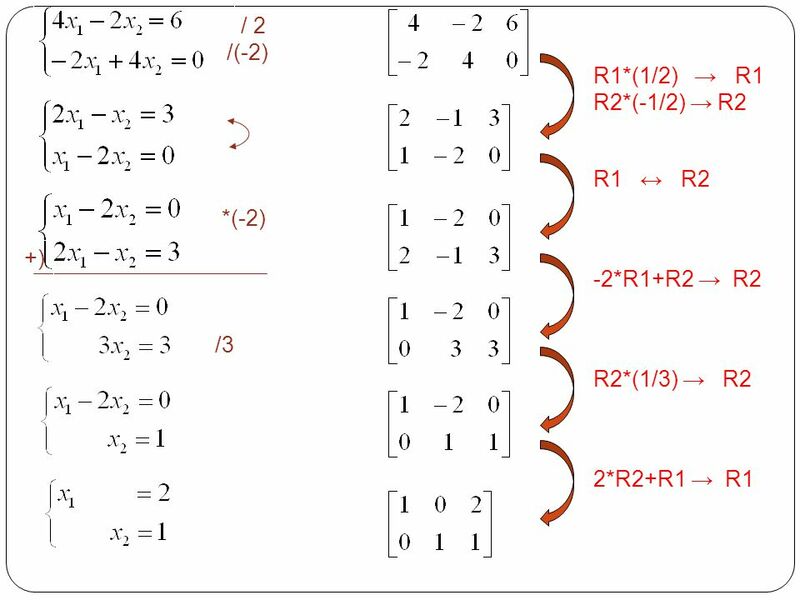 Each leading 1 is the only nonzero entry in its column. 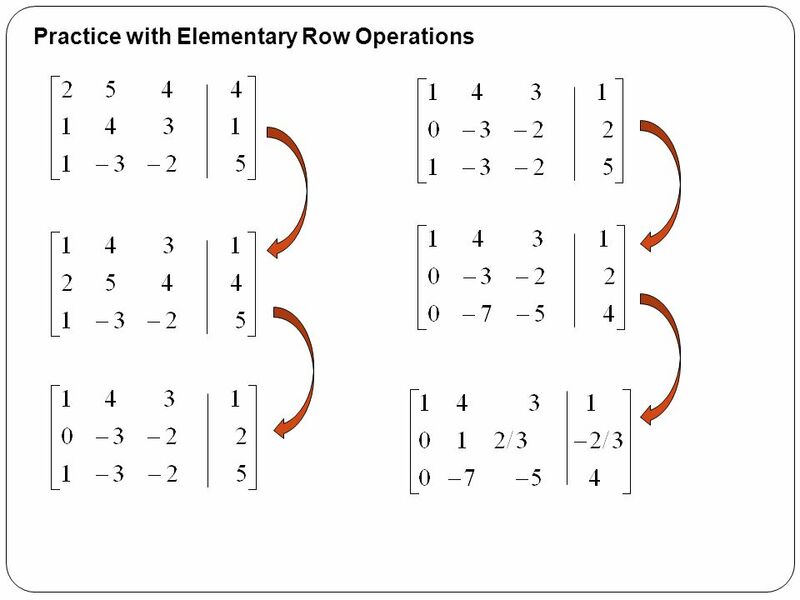 Each leading 1 of a row is in a column to the right of the leading 1 of the row above it. 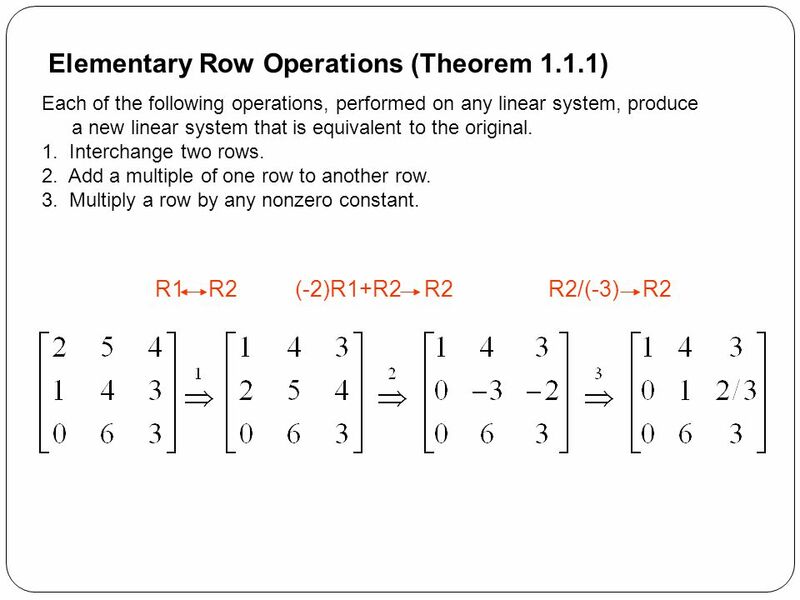 All nonzero rows are above any rows of all zeros. 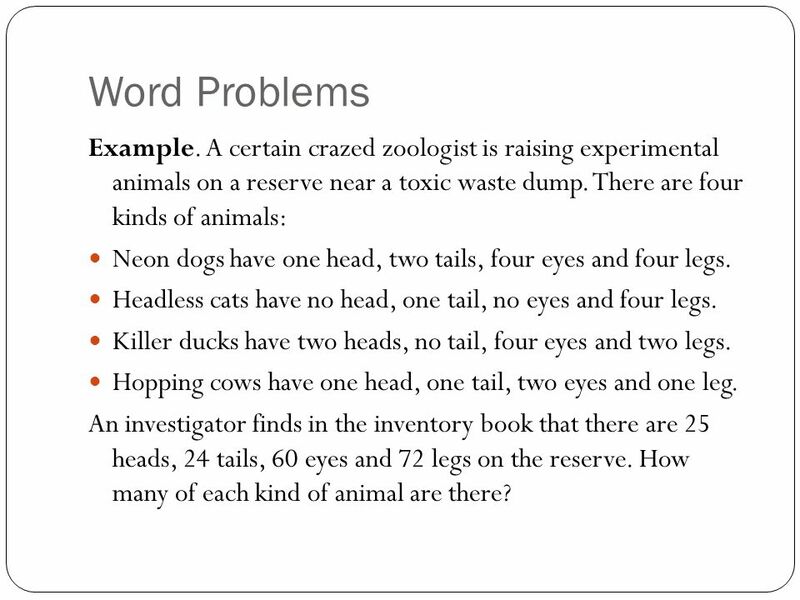 16 Word Problems Example. A certain crazed zoologist is raising experimental animals on a reserve near a toxic waste dump. There are four kinds of animals: Neon dogs have one head, two tails, four eyes and four legs. Headless cats have no head, one tail, no eyes and four legs. Killer ducks have two heads, no tail, four eyes and two legs. Hopping cows have one head, one tail, two eyes and one leg. An investigator finds in the inventory book that there are 25 heads, 24 tails, 60 eyes and 72 legs on the reserve. How many of each kind of animal are there? 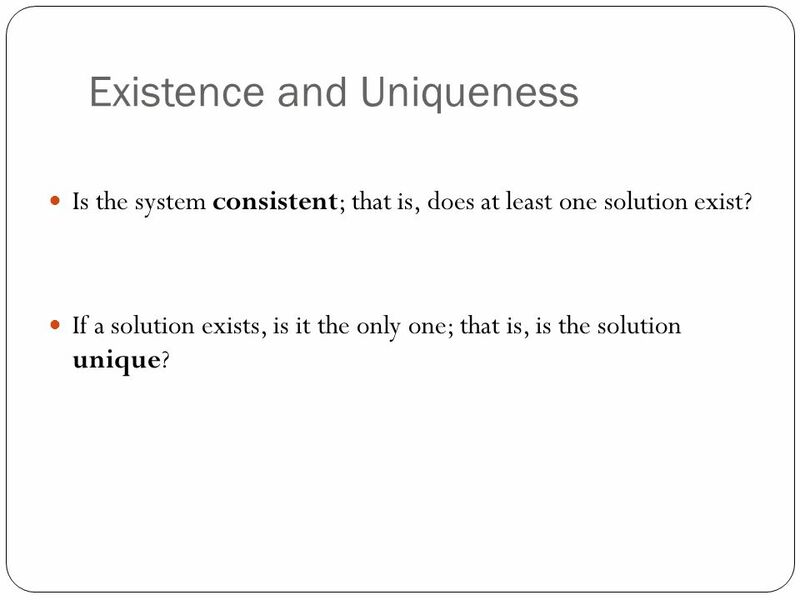 Is the system consistent; that is, does at least one solution exist? 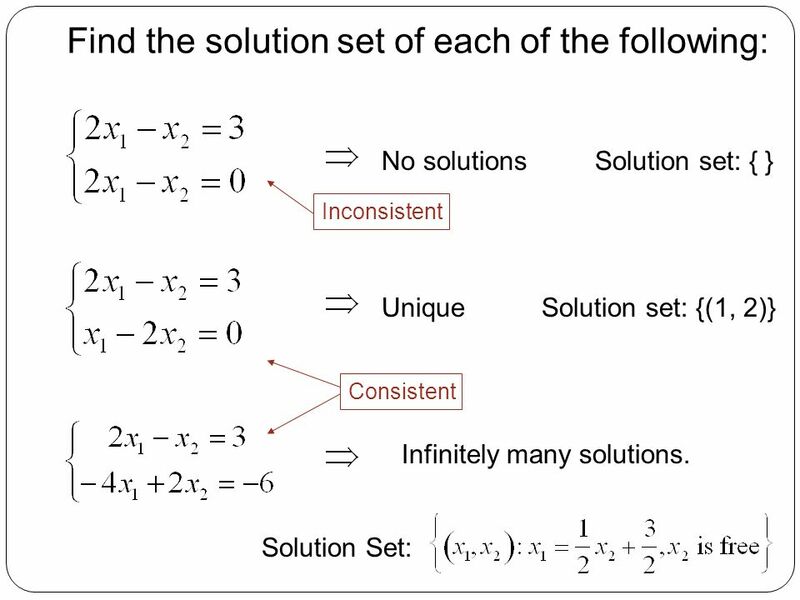 If a solution exists, is it the only one; that is, is the solution unique? 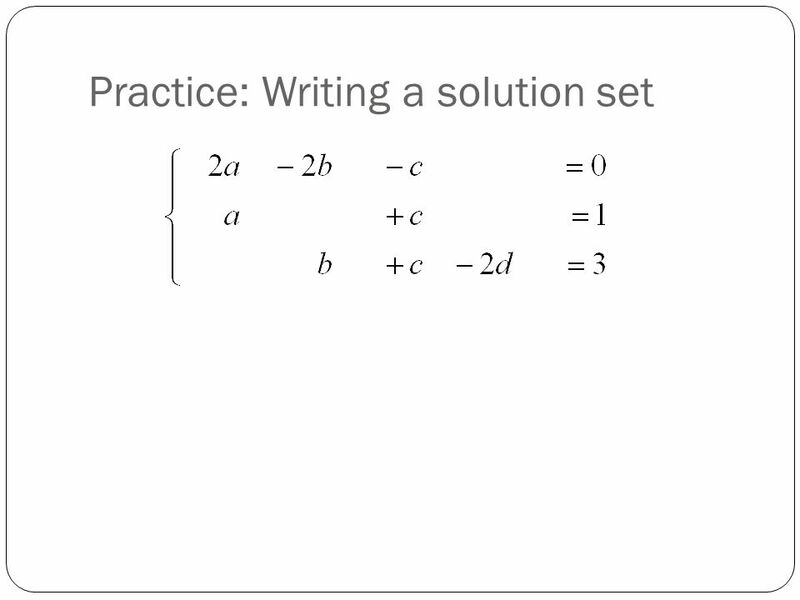 No solutions, or Exactly one solution, or Infinitely many solutions. 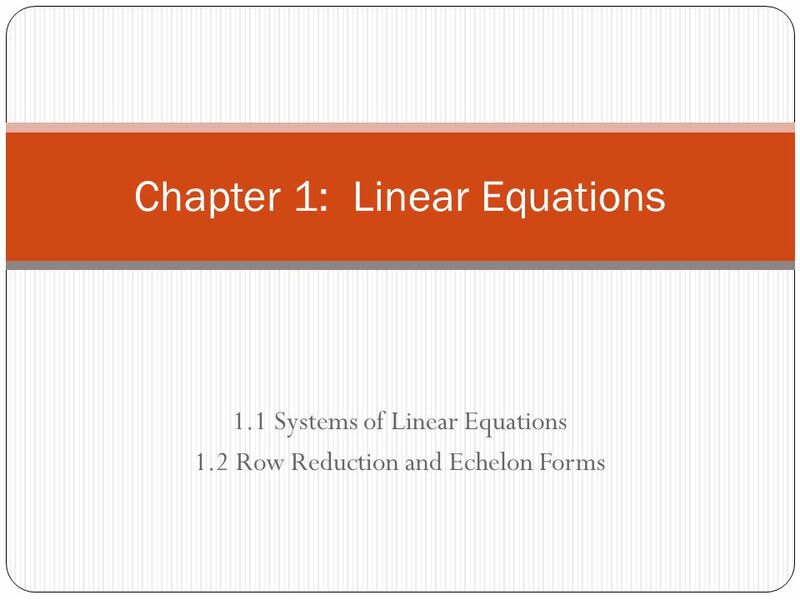 Download ppt "Chapter 1: Linear Equations"
Section 2.2 Systems of Liner Equations: Unique Solutions. 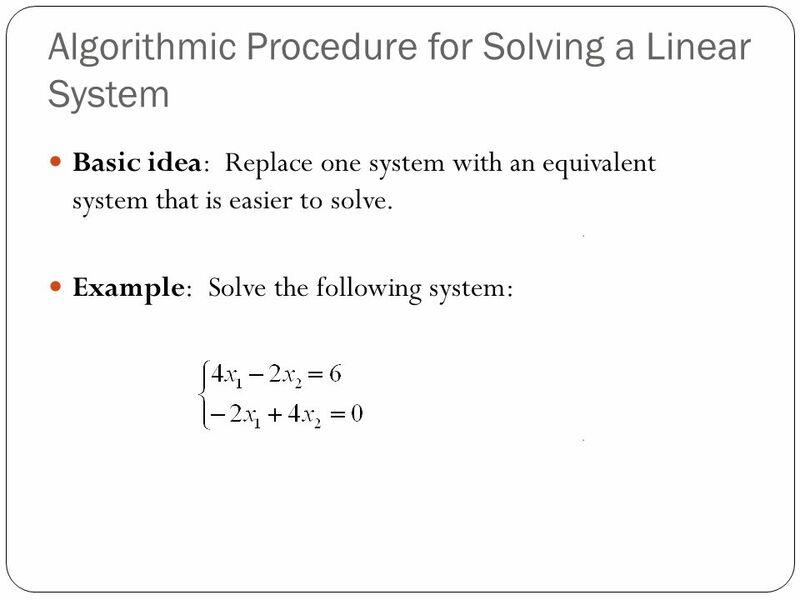 4.3 Matrix Approach to Solving Linear Systems 1 Linear systems were solved using substitution and elimination in the two previous section. This section. 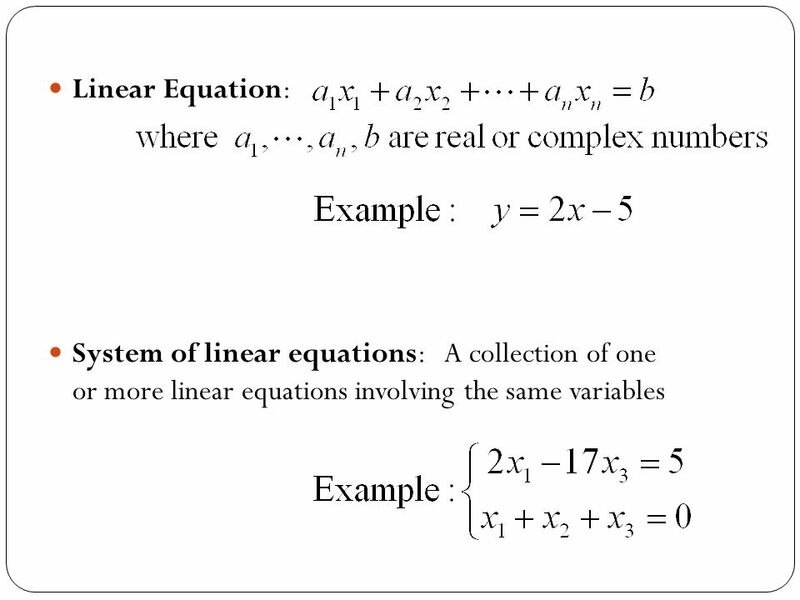 Chapter 4 Systems of Linear Equations; Matrices Section 2 Systems of Linear Equations and Augmented Matrics. 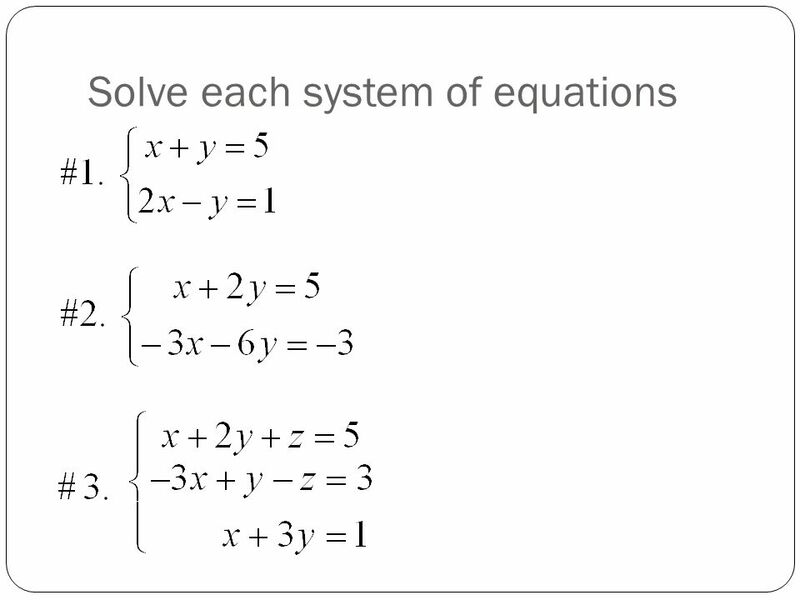 1 Copyright © 2015, 2011, 2007 Pearson Education, Inc. Chapter 4-1 Systems of Equations and Inequalities Chapter 4. 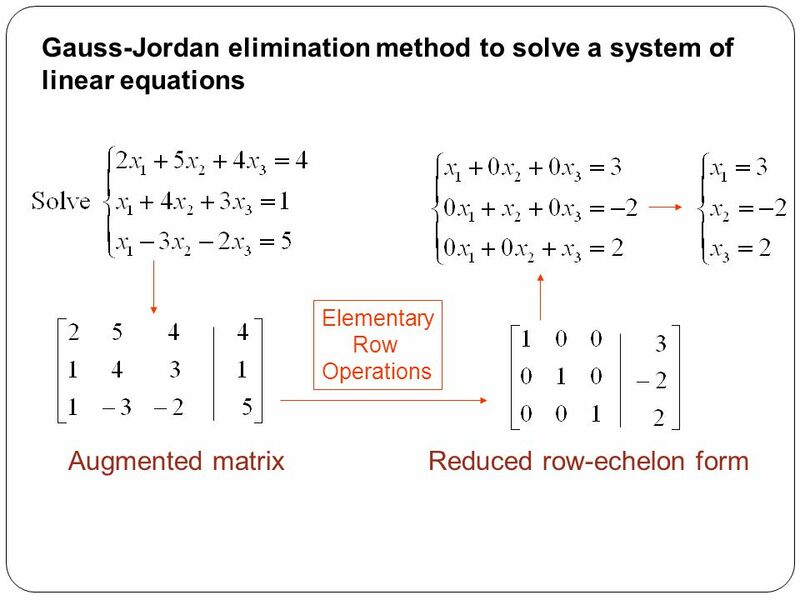 Matrices. 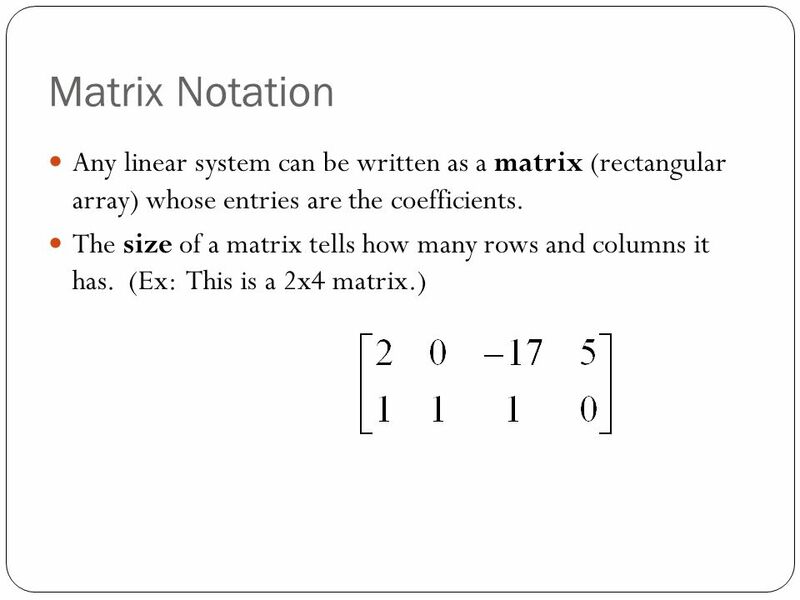 Special Matrices Matrix Addition and Subtraction Example. 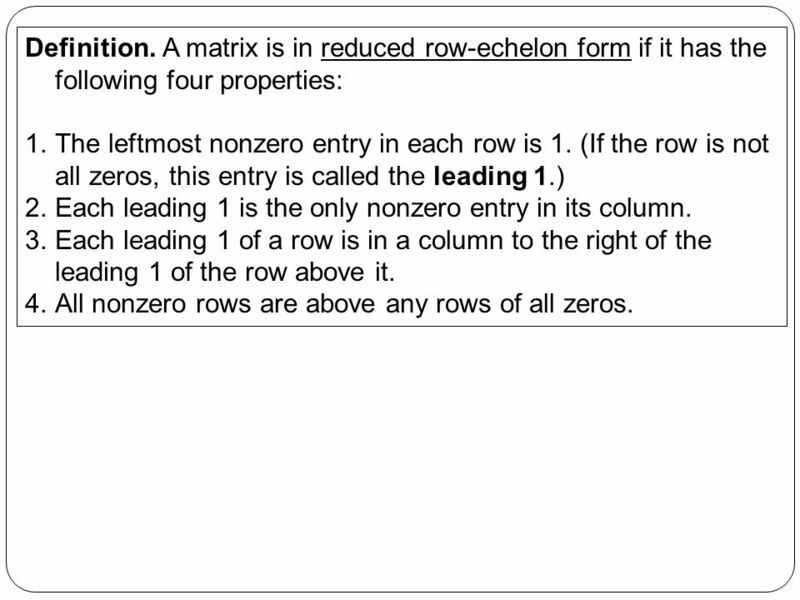 Row Reduction and Echelon Forms (9/9/05) A matrix is in echelon form if: All nonzero rows are above any all-zero rows. 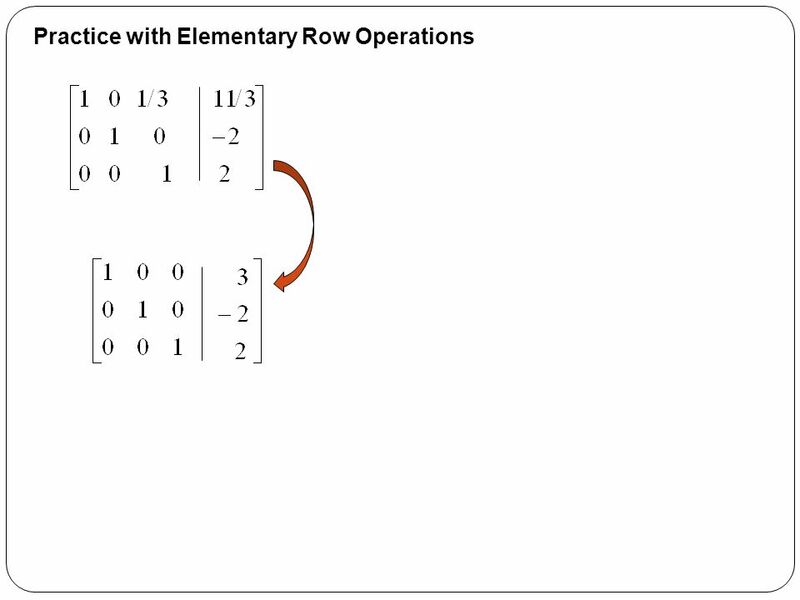 Each leading entry of a row is in.